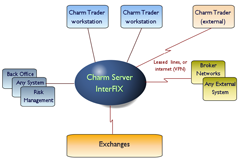 Charm InterFIX offers high-performance connectivity between your customers, your trading systems and external exchanges and brokers. Charm InterFIX is a dynamic and configurable FIX hub. 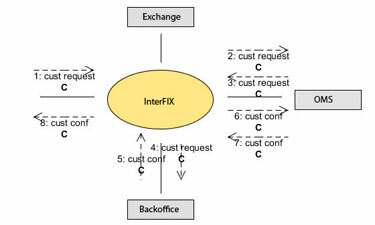 Charm InterFIX offers a FIX based infrastructure for mutual communication. Communication parameters can be set for each connected system seperately. Supported parameters are among other things the FIX version and routing strategies. Charm InterFIX shortens your time-to-market. Customers can send orders electronically which pop-up immediately in your order management system. Depending on order limits set, the orders are send directly to the exchange or await your approval. Executions will be send real-time to your backoffice and reported to your customers. Manage Charm InterFIX and all its connections with Charm Monitor. Charm Monitor clearly shows status en configuration data of Charm InterFIX and its connections. Charm Monitor allows you to change them at run time. Charm Monitor simplifies and accelerates troubleshooting.